Is The Mad Butcher Mad? The love-in between the Mad Butcher and the Prime Minister, dutifully reported in every detail by complaisant media, is perhaps best described as reciprocal back-scratching – a term that is at least more polite than alternative anatomical allusions that might come to mind. But while Sir Peter Leitch might have every reason, in view of favours received, to respond with a typically high-octane endorsement of the Prime Minister, the rest of us might be a little cautious. We might take the view that John Key and his government should be judged by other and more demanding criteria. Like, for example, their success or otherwise in managing the economy. We all know, don’t we, that while the rest of the world is struggling, New Zealand is doing pretty well? At least, that is what we are constantly told. And it is certainly true that we have good reason to suppose that the deep and intractable problems that afflict others have passed us by. Our main export markets happen to be, after all, two of the most buoyant economies in the world. Our commodity prices have reached record levels. 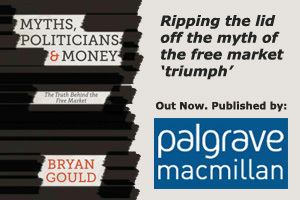 The government’s debt, though constantly offered as the reason for public spending cuts, is – thanks largely to the prudence of the previous government – amongst the lowest in the developed world. Our often-maligned Australian-owned banks are a bastion of stability in a world facing renewed financial meltdown. By contrast, other (and major) parts of the world economy are facing really tough times. The Americans are paralysed by political conflict. The eurozone is engaged in a losing battle with debt – a contagion that seems to be spreading like wildfire. And the British are determined to inflict on themselves a home-grown version of austerity that ensures that there is to be no early recovery from recession. So, we surely have every reason to expect that our good fortune will be recognised by the credit-rating agencies and that we will show up as one of the bright spots in the OECD. So, why have we suffered a credit downgrade? And why do Standard and Poor’s and Fitch seem not to have taken much notice of the government’s feel-good message? They are more concerned with our high external debt, which they say is on track to get worse, not better. And if we really are bucking the trend, that should surely show up in the most recent quarterly GDP tables? Yet sadly, the OECD’s second-quarter GDP figures also tell a rather different story. New Zealand recorded a 0.1% growth rate in that quarter – a figure that means that we are out of recession by just about the smallest statistical margin possible. But wait, as the TV ads say, there’s more. The figures show that while there are a few OECD members who have done worse than us (and one or two have actually gone backwards), the majority have done significantly better than us. The paralysed Americans? They scored double our rate at 0.2%, as did the British, and the eurozone as a whole. European members of the OECD did better still at an average 0.4%. The debt-ridden Italians managed 0.3% and the equally debt-ridden Irish a whopping 1.6%. Our neighbours across the Tasman, on whom we are supposed to be gaining, did 12 times better at 1.2%. We are told that we must expect tougher conditions to come. The Prime Minister, using a metaphor that typically places him in a sporting context, assures us that we can expect him to “roll with the punches”; but it is difficult to do that when you are flat on the canvas. The story we are told is not, in other words, borne out by the facts. And those facts are most brutally apparent to all those who suffer directly from our failure to make the most of our relative good fortune, but who don’t make it into the media that often. Foremost among them are those who go to make up our obstinately high unemployment total – a statistic that not only means a constant drag on our economy and a diminution in our national wealth, but that also represents tens of thousands of wrecked individual lives. And sadly, the fastest growing element in the shameful jobless total is young people. Their rising numbers mean that young people now constitute a higher proportion of our unemployed – at 45% – than in any other OECD member country. That statistic, coupled with the equally shameful and rising level of child poverty, shows that our failures are not just for here and now; we are building a divided and broken society for a generation and more to come. Too many of our younger generation are condemned to a poor start, denied through public service cuts the early childhood education that would give them a chance, suffering poor health through the illnesses and diseases of poverty, unable to afford or qualify for skill training, vainly looking for paid employment in an economy that has already thrown thousands on the scrapheap, taking tragic refuge in drugs, prostitution and crime. A constant diet of feel-good stories is all very well; but those who care about our country will want to dig deeper and make their judgments accordingly. This article was published in the NZ Herald on 3 October.